Found it! Can I compile Python through cmd.exe, like with Java? This is amazing! 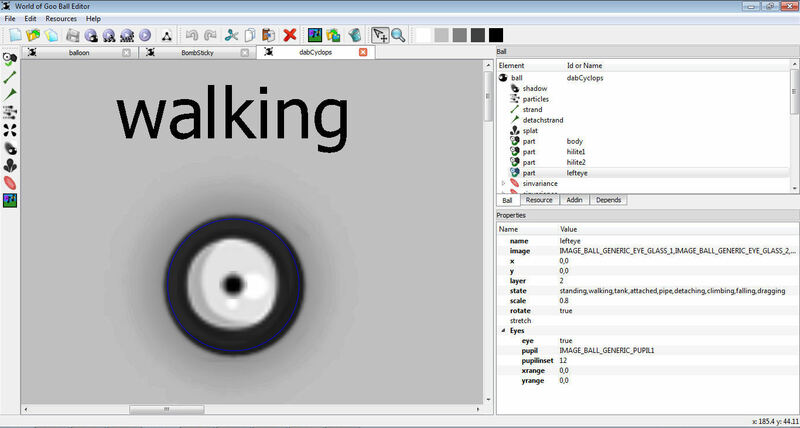 Are you ever planning to make a tool for creating movies (WOG of course ) ? And yes, it is a cool program, so far. Still some glitches, and I haven't had a chance to do much with it, but it's gonna be good. In case you are wondering, no, there's no download link. It's still in alpha test, and hasn't been released publicly yet. Could you give me a copy? Please? I can't believe it! Very GOO-D work! please can you make this for mac? where out here too, you know. waiting. Come to think of it, who was it that originally made the Mac versions for WooGLE? Are they still active on the forum? aguyshat: Can you please stop asking over and over? If you want a Mac version, it would be helpful if you could read up on building Python QT (or whatever this is) on Mac, and build it. But I don't think that the person who originally built the first Mac versions is even on this forum anymore, and hardly anyone here has a Mac (nobody is in a good position to make this for you). Sorry. Hi. I have a problaymo. I run this program as administrater (and normal) and it says that my location thingy does not exist and that I probably provided an incorrect world of goo directory. I'm pretty sure it's the right one. There is a problem with autoattach, see forum post about it. If the towermass is negative, the game crashes when you drag a Gooball on a structure. It didn't crash when the ball jump on the structure. Throwing from distance is ok too, but when you see the "ghost" of the ball on a the strand and then let it go the game freezes. Who knows how to change a color for goo ball? Make a new body image, and change the color of that. Import that, replacing the original image. Yes thank you! Sorry, I know you don't really like questions but I've got another one question only it's about goo level editor. How can I get pipe in front of backgrounds if it's behind. I need that because when I'm playing the level it's invisible. How can I get it in front ? I never said that I didn't like questions. To get a pipe behind the background, change the background's depth to be behind the pipe (-100 or so should do the trick). OK. But I have another question. 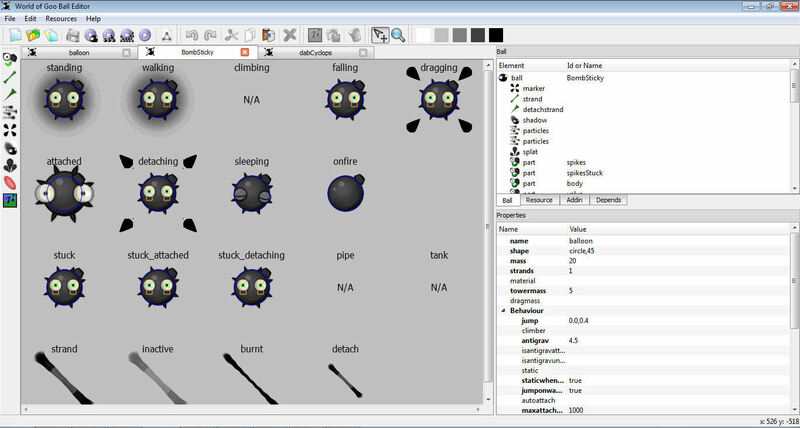 How to make spikes spike-able? Like, to actually kill Goo Balls that come into contact with them? You'll need to create some geometry over where the spike images are with tag = deadly (or mostlydeadly if you want Bone Goo Balls to survive on contact). What do you mean? Where exactly I need to write mostdeadly? There is no written geometry anywhere there in the spike properties! Yep, you have to put some geometry there where the spikes are. (if the spikes aren't terribly tall, a single rectangle will do, spanning the whole area). Then add tag=deadly on that rectangle. What exactly is geometry in the editor and where I can find it? Click "Add rectangle" in the left pane. Move and scale this rectangle to the position and size of your spikes, then add tag=mostlydeadly or tag=deadly to the rectangle. Thank you! Soon I will can put in goofans.com my new level "Weird bony help"! The "Reference Guide" is especially helpful. If you can't find the answers to the questions you have after poking around there, let us know and we'll be glad to help. *What's the difference between Cut and Delete? This is identical to the Cut and Delete in a lot of programs. Cut deletes the item and puts it on the clipboard, so you can paste it later. Delete just wipes it out of existence. Only one special question: What I need to do to cogs will make beauty and ugly goo balls to beauty or ugly product? You need to add a geometry of a circle, with the tag of ballbuster. You can also use tag=mostlydeadly, but this will only work successfully on Uglies. One other question that you will not find the answer to in the reference guide: to change the map screen, you need to edit the level MapWorldView. If you need any help, email me at AlbinoPokey (at) gmail (dot) com. I've got one last (may be) question: where I can change how many goo balls I need to get in the pipe at the level (I'm NOT talking about OCDs because I know how to get them)? You should have checked the pages I linked to more closely. The "ballsrequired" field in the level tree is where that is found. 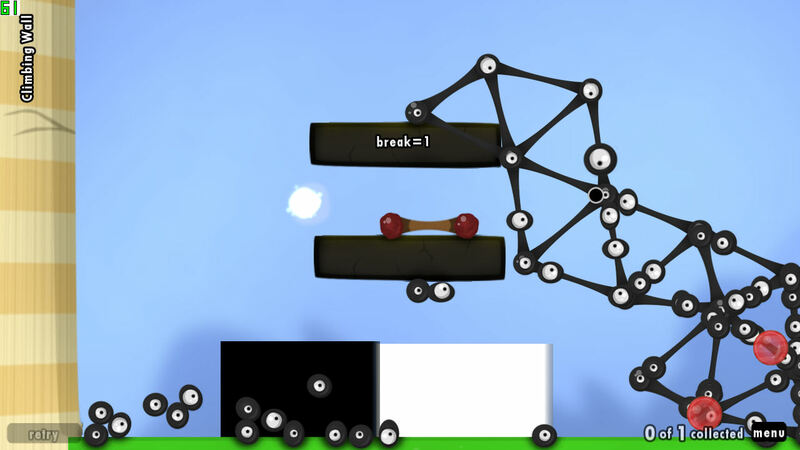 The level tree also contains such things as "timebugprobability", which will create time bugs if set to a number between 1 and 0. You can also change the cursor color there. I can't find anything about this. May be you just tell me if you know? There isn't anything about that - how change goo ball score I need to collect in the pipe. No, no no! I found it but I don't understand anything about balls required there! ballsrequired is a number. How many Goo Balls you need. That's all there is to it. Yea, but how to CHANGE it in WOGLE (World of goo level editor)?! On the right side of the screen, there are several tabs. One of them is called "Level." Click this. Above the tabs now, you should see a list of different items. Click the topmost one, which will be called "level." Below the tabs now should be a list of items. Search for one of them with the name "ballsrequired." When you find it, change it to the number of Goo Balls you wish to be the goal for the level. All of this information is in the pages I've linked you to twice now. I'd advise reading through all of them in their entirety in order for you to gain a better understanding of the editor and goomodding in general. Also, please edit your previous posts rather than posting twice in a row. I don't think Daft is here anymore, but you could try to build from source. Simple. Install and run the "rc1 source". It works fine under Linux for me, and both Linux and Mac are UNIX-based, so it ought to be similar at least for you. I have zero Mac knowledge, but you can try follwing my directions for running it out of Linux and see how far you get. Post if you have any questions. It's written in Python. My mac doesn't have Python. Period. And it's a SHELL file. My mac doesn't recognize it (meaning NO PROGRAM ABLE TO RUN IT). And btw, what instructions are you talking about??? Give me at least a link plz! and it'll run fine. Mac is probably slightly different. Anyway, the idea is that it IS a shell script, but you may have to modify the file permissions to make it executable. No different than any other application, really. when I press world of goo ball editor you can't press anything except file, change world of goo directory... what should I press? You need to browse to a valid custom non-write-protected World of Goo Directory first. Just like WooGLE. Why not offer to make one yourself? That's rather annoying, just saying. He spent a lot of his free time making a program that would help that didn't have to be made, and you want him to spend more time just so you could use it?